This paper proposes a methodological framework for the study of how the Technological Pedagogical Content Knowledge (TPACK) model is integrated into educational activity design and implementation. The proposed framework was elaborated and applied in the context of a course in which student teachers from an early childhood education undergraduate program integrate TPACK into activity design and implementation using information and communications technologies (ICT). The specific methodological framework was designed to take into account the building blocks of TPACK for each part of the course (teaching, designing, and implementing) and to investigate and recombine these using appropriate methods and tools, such as thematic analysis for qualitative data processing and multidimensional data analysis. Findings show that after applying our initial methodological framework, several elements, for example the particular features and specificities of each subject matter in preschool education, needed to be revisited. Angeli, C., & Valanides, N. (2005). ICT-Related Pedagogical Content Knowledge: A Model for Teacher Preparation. In C. Crawford, R. Carlsen, I. Gibson, K. McFerrin, J. Price, R. Weber & D. Willis (Eds. ), Proceedings of SITE 2005-Society for Information Technology & Teacher Education International Conference (pp. 3030-3037). Phoenix, AZ, USA: Association for the Advancement of Computing in Education (AACE). Angeli, C., & Valanides, N. (2009). Epistemological and methodological issues for the conceptualization, development, and assessment of ICT–TPCK: Advances in technological pedagogical content knowledge (TPCK). Computers & Education, 52(1), 154–168. Archambault, L., & Barnett, H. J. (2010). Revisiting technological pedagogical content knowledge: Exploring the TPACK framework. Computers & Education, 55(4), 1656–1662. Auerbach, C. F., & Silverstein, L. B. (2003). Qualitative Data: An Introduction to Coding and Analysis. New York, NY: NYU Press. Beer, M., Eisenstat, A., & Spector, B. (1990). The critical path to corporate renewal. Boston, MA: Harvard Business School Press. Benzecri, J. P. (1992). Correspondence Analysis Handbook. New York, NY: Marcel Dekker. Blackwell, C. K., Lauricella, A. R., & Wartella, E. (2016). The influence of TPACK contextual factors on early childhood educators’ tablet computer use. Computers & Education, 98, 57-69. Fernández-Balboa, J.-M., & Stiehl, J. (1995). The generic nature of pedagogical content knowledge among college professors. Teaching & Teacher Education, 11(3), 293–306. Fraser, E. D., Dougill, A. J., Mabee, W. E., Reed, M., & McAlpine, P. (2006). Bottom up and top down: Analysis of participatory processes for sustainability indicator identification as a pathway to community empowerment and sustainable environmental management. Journal of Environmental Management, 78(2), 114-127. Hammond, T. C., & Manfra, M. M. (2009). Giving, prompting, making: Aligning technology and pedagogy within TPACK for social studies instruction. Contemporary Issues in Technology and Teacher Education, 9(2), 160–185. Jang, S.-J. (2010). Integrating the interactive whiteboard and peer coaching to develop the TPACK of secondary science teachers. Computers & Education, 55, 1744–1751. Jimoyiannis, A., & Komis, V. (2006). Exploring secondary education teachers’ attitudes and beliefs towards ICT adoption in education. Themes in Education, 7(2), 181-204. Johnson, R. A., & Wichern, D. W. (1992). Applied Multivariate Statistical Analysis (Vol. 4). Englewood Cliffs, NJ: Prentice Hall. Koehler, M. J., & Mishra, P. (2008). Introducing TPCK. In AACTE Committee on Innovation and Technology (Eds. ), Handbook of Technological Pedagogical Content Knowledge (TPCK) for Educators (pp. 3–29). New York, NY: Routledge. Koh, J. H. L., Chai, C. S., & Tsait, C. C. (2010). Examining TPACK of Singapore preservice teachers with a large-scale survey. Journal of Computer Assisted Learning, 26(6), 563–573. Komis, V., Tzavara, A., Karsenti, T., Collin, S., & Simard, S. (2013). Educational scenarios with ICT: an operational design and implementation framework. In R. McBride & M. Searson (Eds. ), Proceedings of SITE 2013-Society for Information Technology & Teacher Education International Conference (pp. 3244-3251). New Orleans, Louisiana, United States: Association for the Advancement of Computing in Education (AACE). Mor, Y., & Mogilevsky, O. (2013). The learning design studio: collaborative design inquiry as teachers’ professional development. Research in Learning Technology, 21(1), 1-15. Mwalongo, A. (2011). Teachers’ perceptions about ICT for teaching, professional development, administration and personal use. International Journal of Education and Development using Information and Communication Technology, 7(3), 36-49. Plowman, L., Stephen, C. & McPake, J. (2010). Growing up with technology: Young children learning in a digital world. London, UK: Routledge. Sabatier, P. A. (1986). Top-down and bottom-up approaches to implementation research: a critical analysis and suggested synthesis. Journal of Public Policy, 6(1), 21-48. Shin, T., Koehler, M., Mishra, P., Schmidt, D., Baran, E., & Thompson, A. (2009). Changing technological pedagogical content knowledge (TPACK) through course experiences. In I. Gibson, R. Weber, K. McFerrin, R. Carlsen & D. Willis (Eds. ), Proceedings of SITE 2009-Society for Information Technology & Teacher Education International Conference (pp. 4152-4159). Charleston, SC, USA: Association for the Advancement of Computing in Education (AACE). Valanides, N., & Angeli, C. (2002). Challenges in achieving scientific and technological literacy: Research directions for the future. Science Education International, 13(1), 2–7. Yelland, N. (2007). Shift to the future: rethinking learning with new technologies in education. London, UK: Routledge. Zhao, Y., & Bryant, F.-L. (2006). Can teacher technology integration training alone lead to high levels of technology integration? A qualitative look at teachers’ technology integration after state mandated technology training. 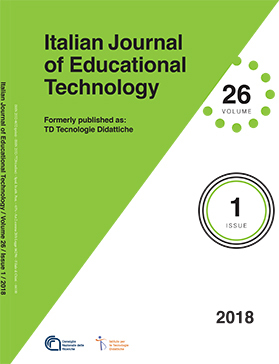 Electronic Journal for the Integration of Technology in Education, 5, 53–62.